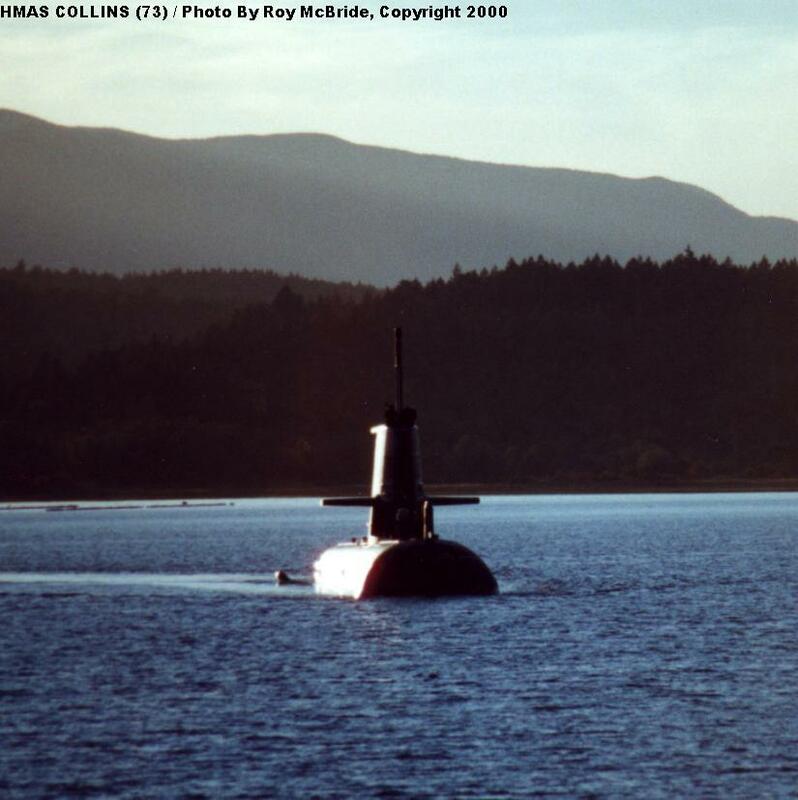 During October 2000, the submarine HMAS Collins was conducting acoustic trials on the test ranges at Nanoose Bay, British Columbia, Canada. 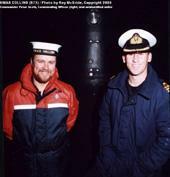 Roy McBride was given the rare opportunity to photograph not only the Nanoose Bay facilities, but also HMAS Collins, inside and out. This Photo Feature presents the photos of Collins, including many details that have never been shown before. 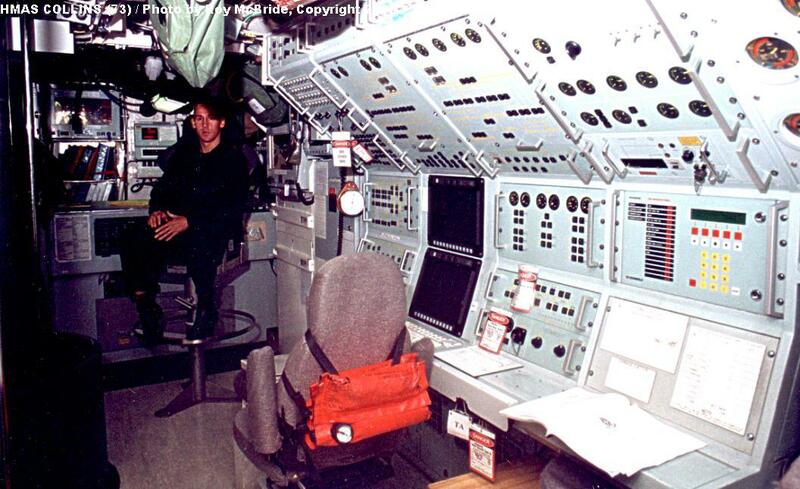 There is also a separate Photo Feature showing the facilites of the Nanoose Bay Test Range. HMAS Collins is the lead-ship of the Royal Australian Navy's new submarine class. 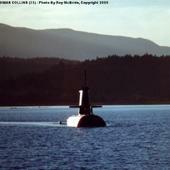 The Collins class is one of the newest diesel-electric submarine designs in the world. 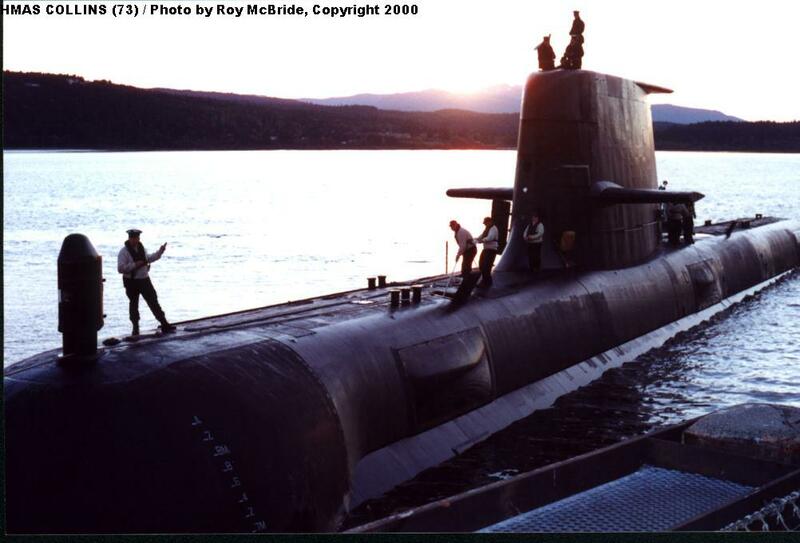 Unfortunately, these boats have suffered a number of significant technical problems, including excessive flow noise, propeller cavitation and fatigue problems, unreliable diesel engines, and deficient combat system electronics. 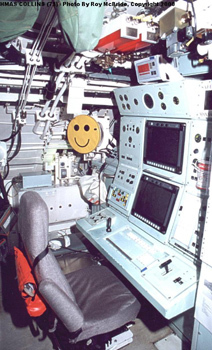 The RAN is in the process of resolving these problems, and Collins has been fitted with a number of the "fixes" for testing purposes. 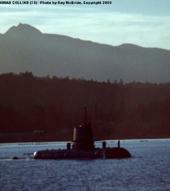 Presumably her visit to the Nanoose Bay test range was related to the testing of flow noise and cavitation corrections. We wish to extend a special "Thank You" to the officers and crew of HMAS Collins for making this feature possible. The thumbnail images and captions are linked to screen-sized images; larger images are linked to the words "Hi-Rez Image". Collins approaches the pier at Nanoose Bay, with the majestic mountains looming behind. Collins turns towards the Nanoose pier. 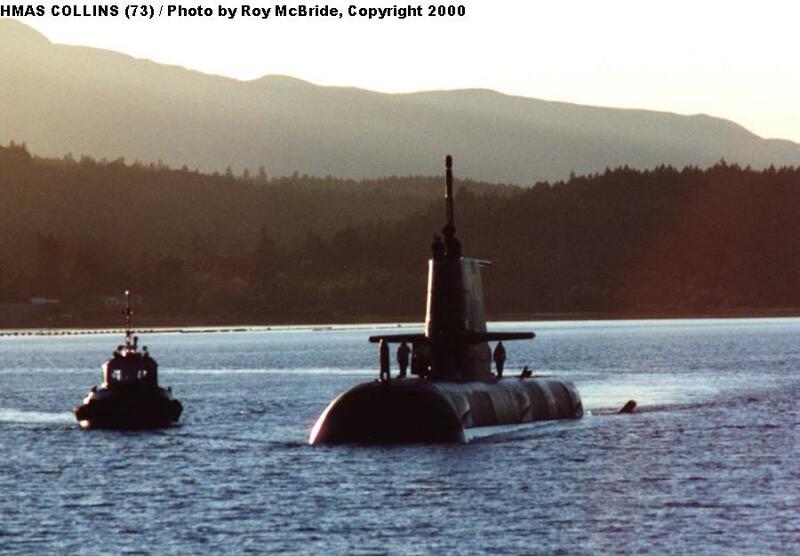 A tug approaches Collins to assist her in maneuvering. With the tug alongside and line handling crews on deck, Collins draws near to the pier. Collins maneuvers alongside the pier as the mooring lines are passed. Note the two "windows" on the hull for the flank sonar arrays, and the smaller "window" on the sail for an active sonar array. 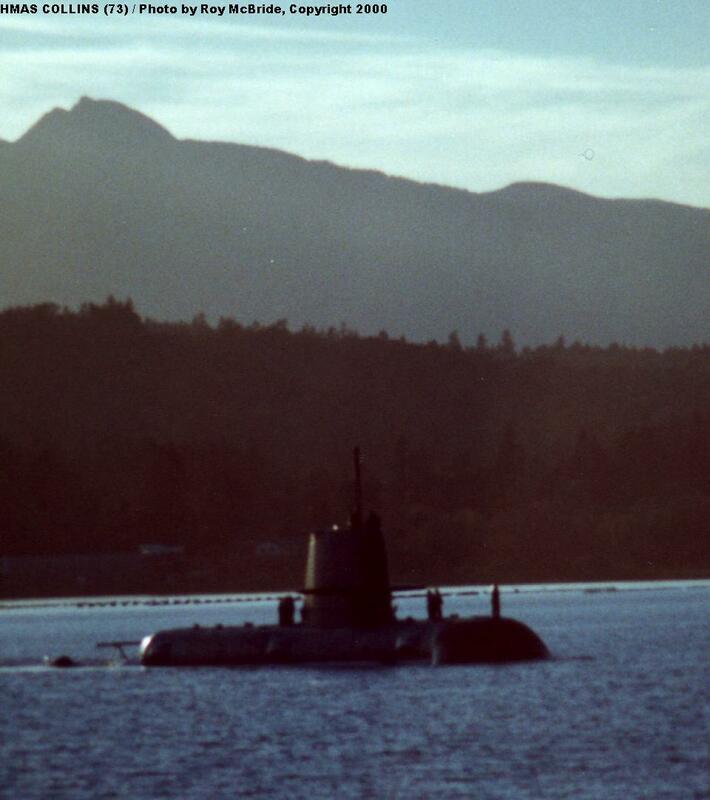 To reduce flow noise problems previously experienced in this class, the sail has been modified with a small fairing at the base and an extended after edge. Collins close alongside the pier. 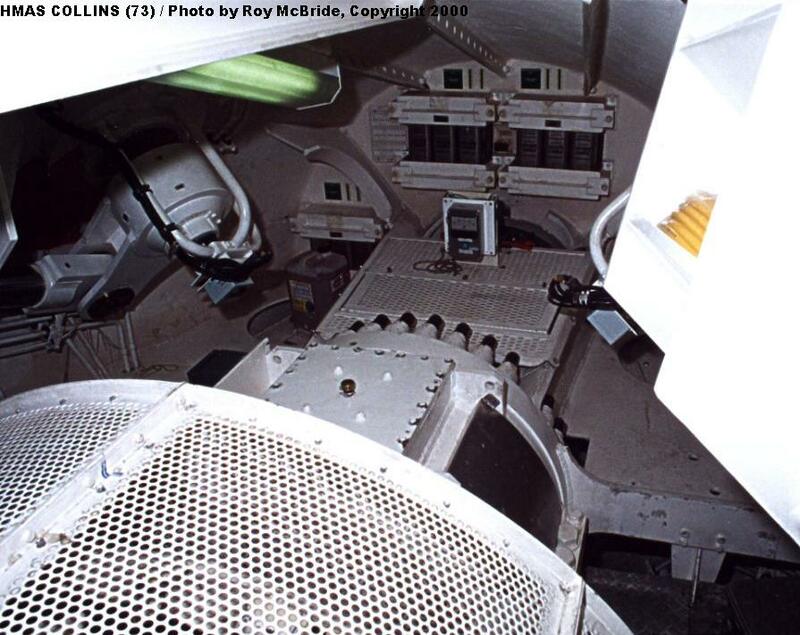 This view shows the flank array windows and the additional fairing at the base of the sail. The tug maneuvers alongside as mooring lines are passed. 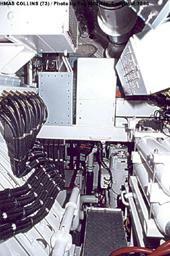 This view shows the third (aft) flank array, directly below the mooring line. 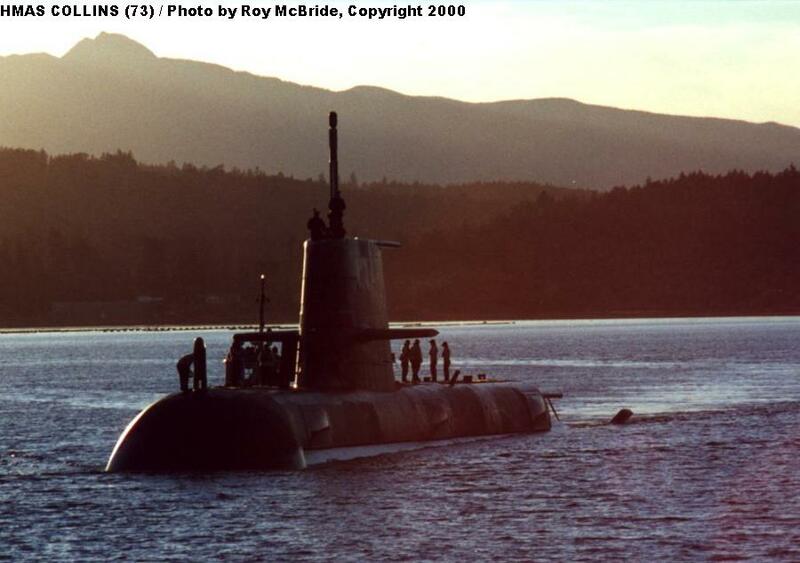 A close view of the sub's extreme stern. 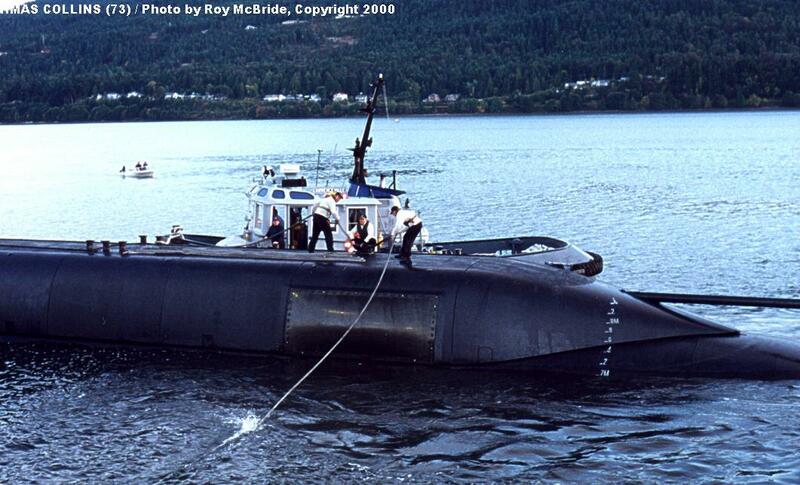 The long 'tube' and strut apparently relate to her towed sonar array. 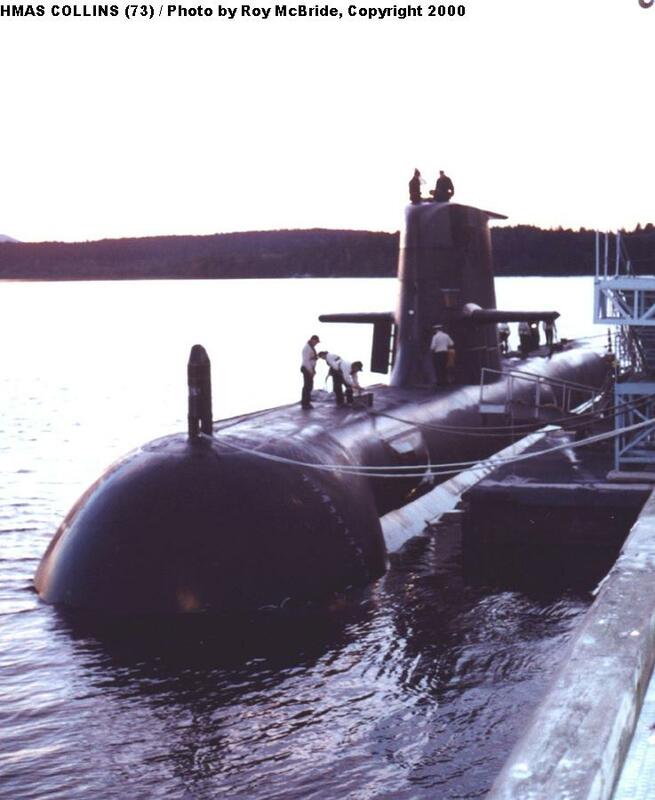 The two fins projecting above the water are part of her stern plane system. 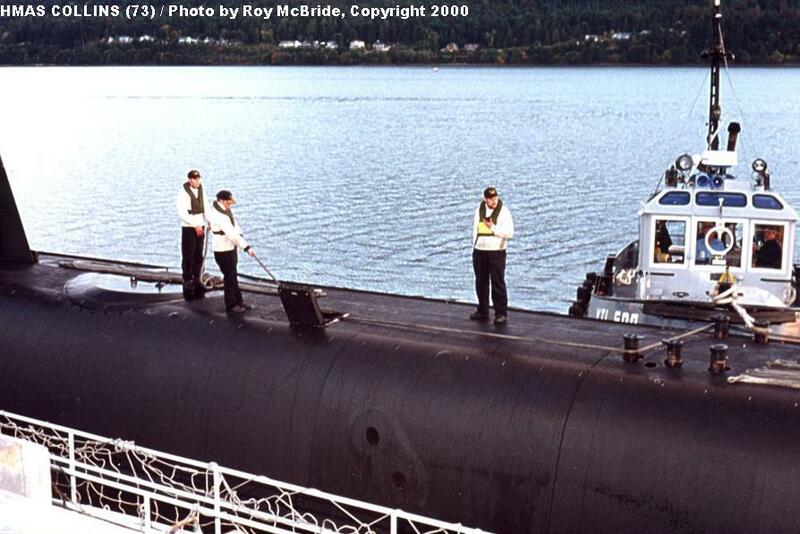 Line handling crews work on the sub's aft deck. 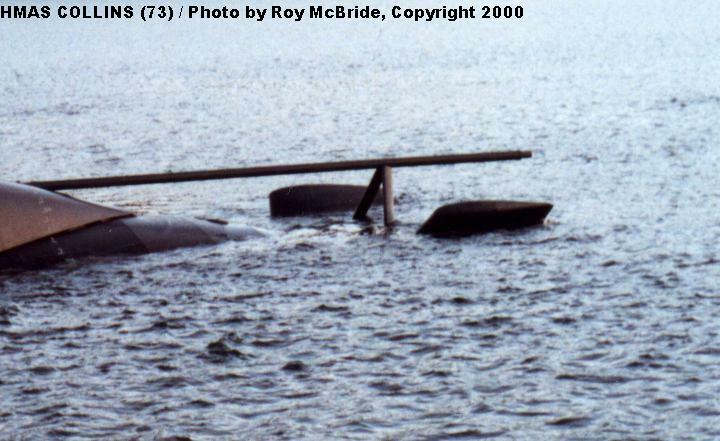 Note the retractable bollards. 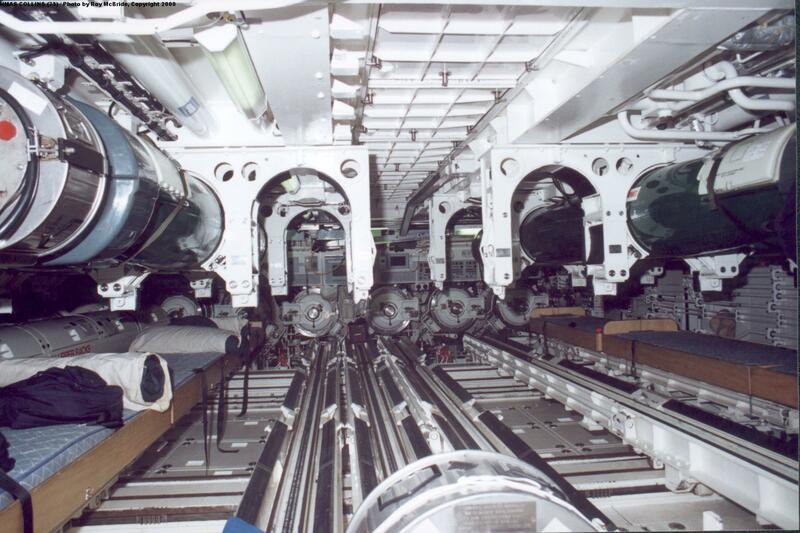 A view of Collins' torpedo room. 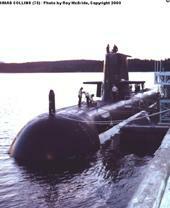 She features a complex mechanical torpedo-handling system, seen here. The six 21" torpedo tubes are in a horizontal line across the front of the space (two tubes at far left are partially concealed). 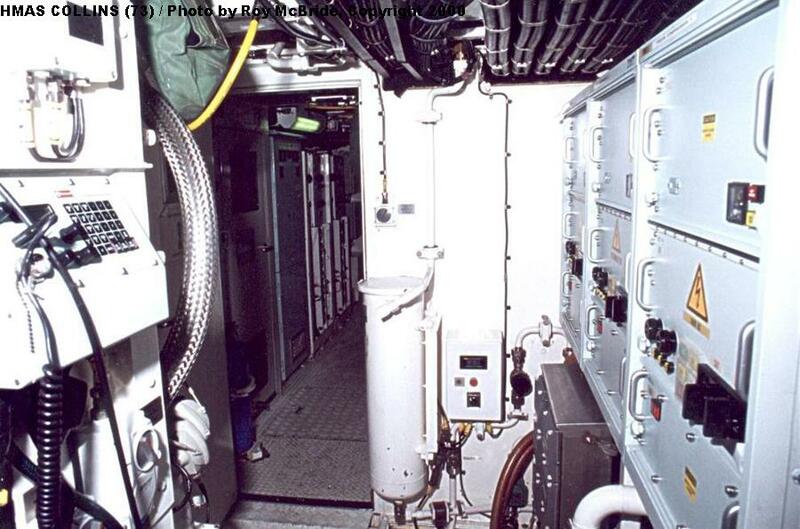 The torpedo room also doubles as a berthing space - note the four temporary bunks installed between the torpedoes. One of the torpedoes in the overhead storage racks in the torpedo room. 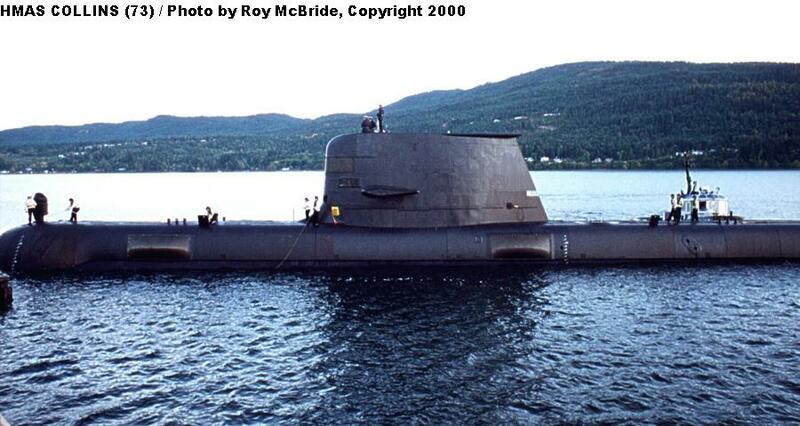 A total of 23 Mk48 torpedoes and Harpoon SSMs can be carried. A countermeasures launcher. 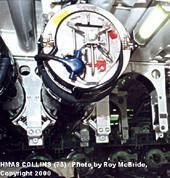 Collins is fitted with two such decoy launchers. 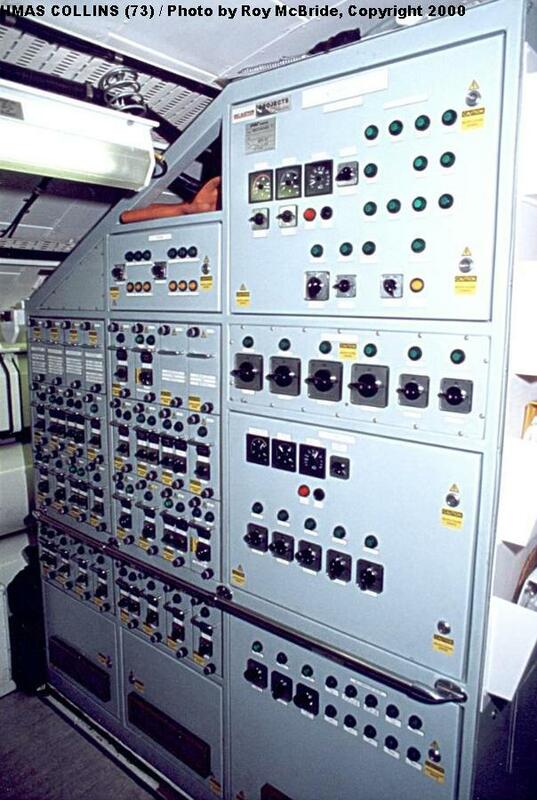 The central control room aboard Collins. The Commanding Officer is seated in his chair at center, with the periscopes at extreme left. 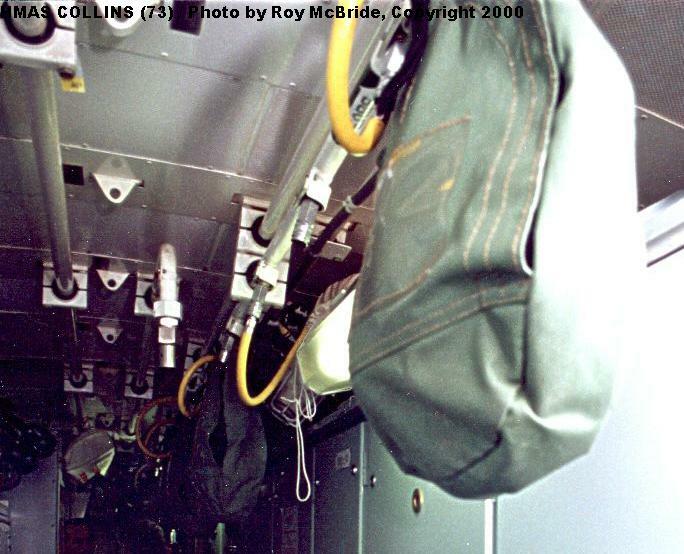 The green bags hanging from the overhead contain emergency breathing apparatus. The Commanding Officer (at center) explaining the function of equipment in the control room. 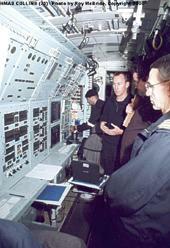 The commander of the Nanoose Bay test ranges, Commander Gord Buckingham, is in the foreground. 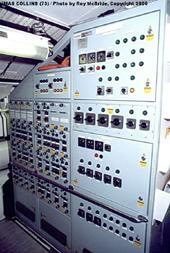 A switchboard in Collins' electrical equipment space. The helmsman's position seat - with controls that might look more appropriate in an aircraft! View down a main passageway aboard Collins. 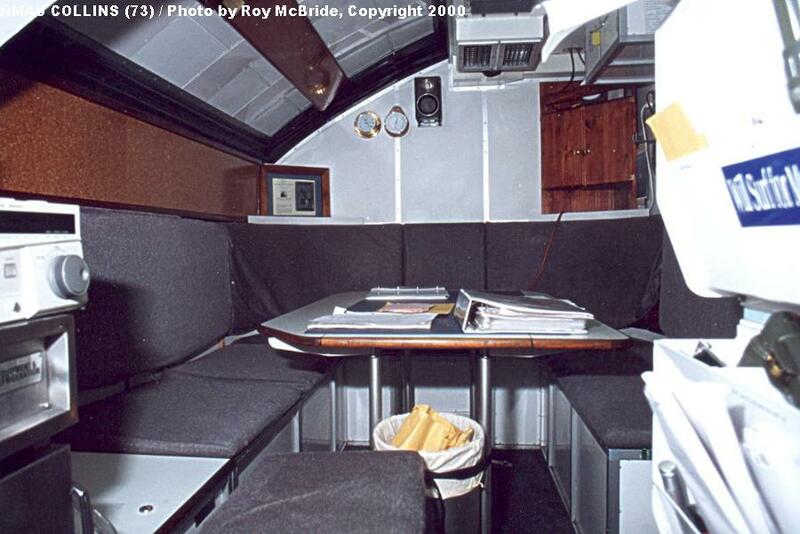 The officer's wardroom - a very small space, but there are only 6 officers aboard the sub. 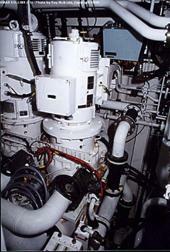 One of Collins' main propulsion diesels. 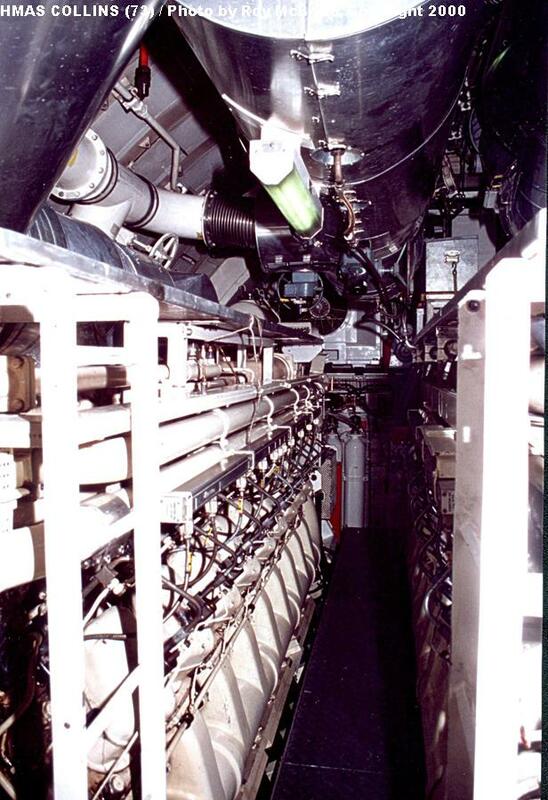 The sub has three of these 18-cylinder, 2,000 horsepower engines. Unfortunately they have suffered significant reliability problems, partially due to problems keeping water out of the fuel oil. 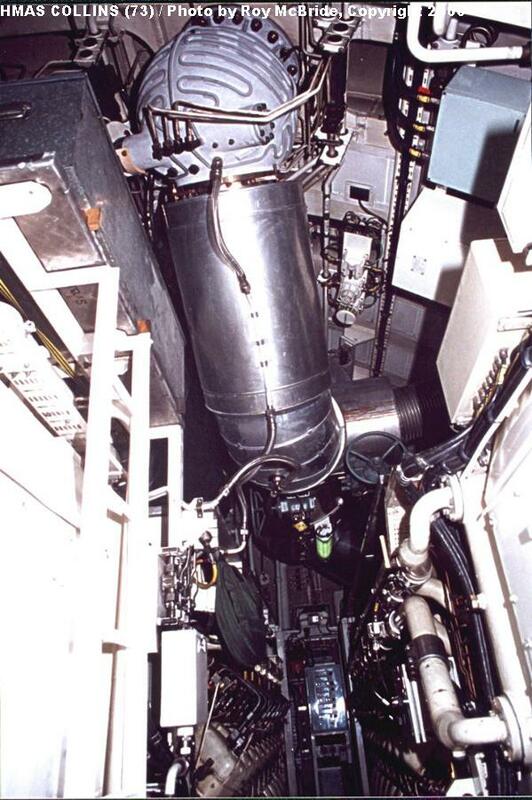 Exhaust ducting from the diesels, and exhaust hull valve. This view is in the engine room, looking down the walkway between two of the diesels. Collins' main propulsion electric motor. 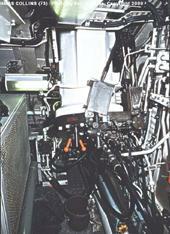 The large cylinder atop the motor is the heat exchanger for the cooling system. 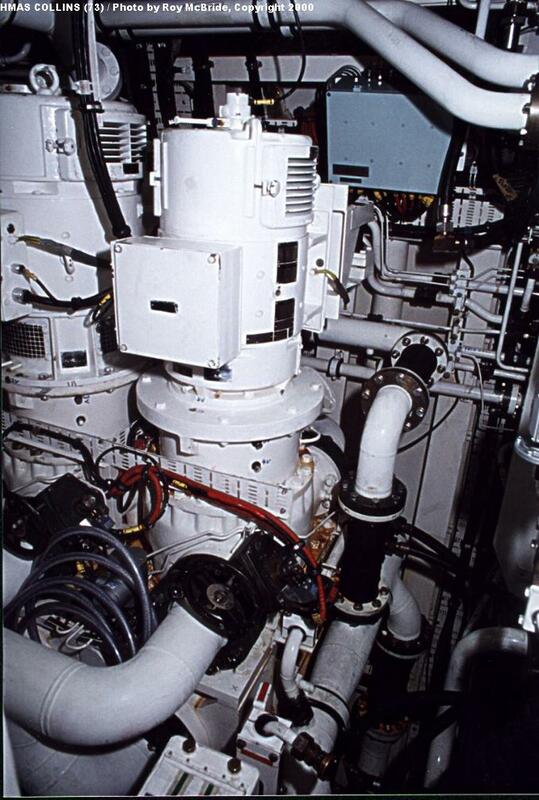 The extreme stern, where the propeller shaft passes through the pressure hull. 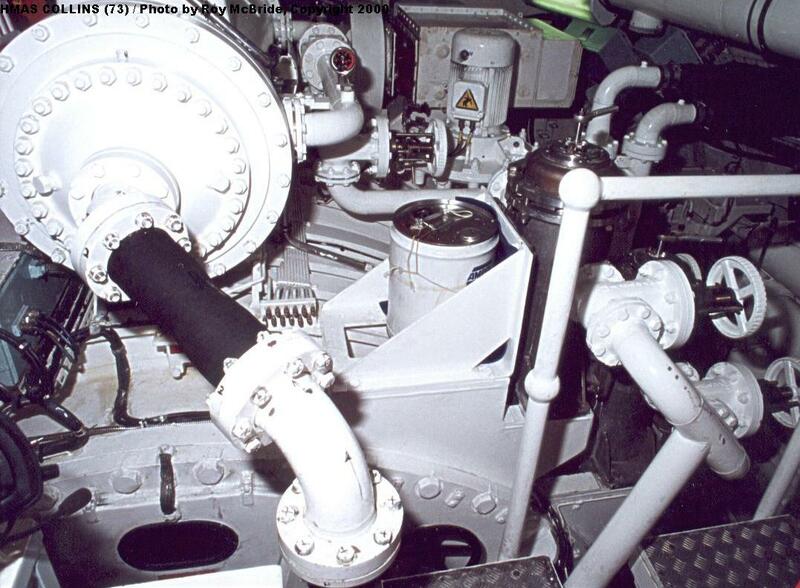 The shaft is concealed by shrouds and bearings, but the shaft seal is barely visible at the bulkhead. Pumps in Collins' machinery spaces. 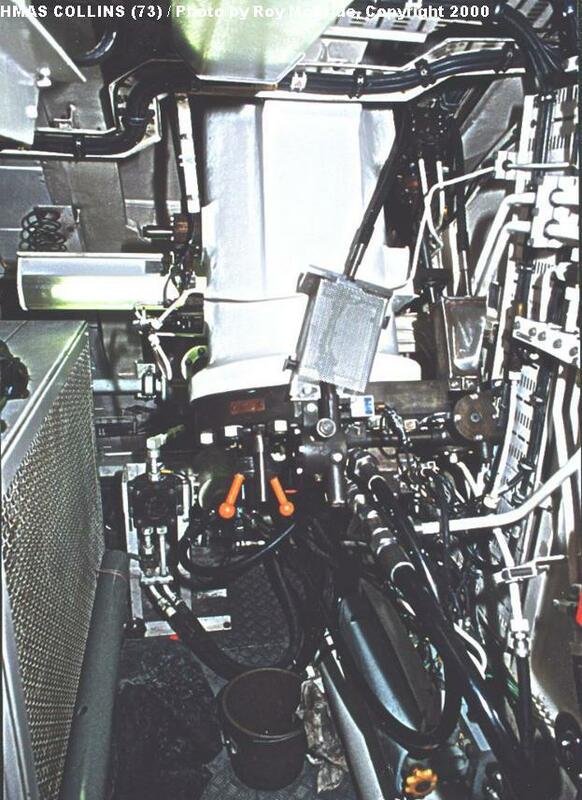 View of some auxiliary equipment and wiring in Collins' machinery spaces. One of the emergency breathing apparatus bags located throughout the boat. Commander Peter Scott, Commanding Officer (right) Leading Seaman Dean Hunt on deck. 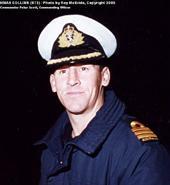 Commander Peter Scott, Commanding Officer.